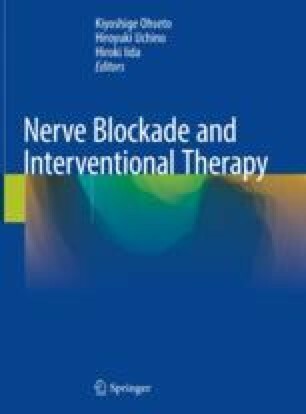 Thoracic epidural block affects spinal nerves and sympathetic nerves of the thorax and can therefore be applied not only as analgesia of the thoracic spinal nerve region but also for control of complex regional pain syndrome (CRPS) in the upper arm; disturbance of peripheral blood circulation, such as Raynaud’s disease; and sympathetic nerve-dependent pain. The best-known procedure is the landmark method followed by X-ray-guided block and ultrasound-guided block. The landmark method has a longer history than the others and is well established, but the latter two methods are indicated in cases in which it is challenging to perform epidural block, such as cases of spinal deformity or severe obesity and in cases in which it is necessary to carefully decide the puncture point, such as herpes zoster patients. In pediatric cases or in obese patients, ultrasound-guided block is applied to select the puncture point or to measure the distance from the skin to the epidural space by pre-scanning prior to the procedure.